My sorority alumna group has a book club, and I’d volunteered ages ago to host in October. Today was the day. We read Jennifer Weiner’s Best Friends Forever, but actually only 2 of the 8 women at book club read the book. This was another example of me realizing that September is a bad month to expect to do things like read books for book club. I had a single-minded focus on school, so everything else just took a backseat. But I have to say, I’m really happy with the spread I put out. Cake, apples and caramel, chips and sour cream salsa, cheese and pepperoni with crackers. 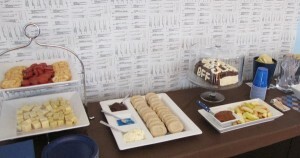 And I absolutely stole Maggie’s Christmas in July idea of a decorate your own cookie station. I cheated on the cookies and used one of those Pillsbury ready-to-bake packages when I ran out of time, and they were a hit. I made the vanilla frosting but not the chocolate. I went with a blue/tan/brown color scheme, and I hung the card catalog fabric I had made from Spoonflower last fall. 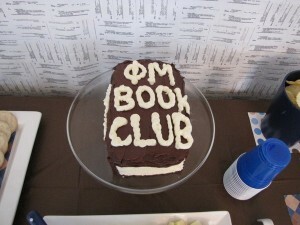 My handwriting on cakes is as bad as it is in real life, but I still like my book club cake. 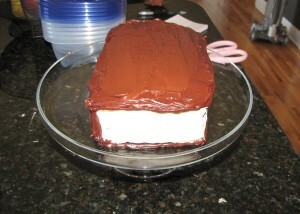 I made a chocolate cake in a loaf pan, trimmed it all around, then covered it with a layer of vanilla frosting. I put it in the fridge overnight, then I covered the “spine” and “front cover” with chocolate frosting (ready made) so it would look like a book. I piped more chocolate frosting all around the bottom edge to look like the back cover of the book. I put “BFF” on the spine since that’s the abbreviation for our book’s title. The lettering is sloppy, but the cake still went over really well. 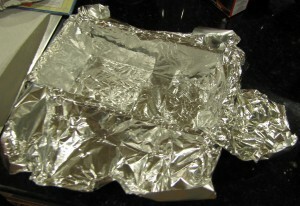 Preheat the oven to 350 degrees F. Line a loaf pan with aluminum foil so it looks like a sling. Whisk the cocoa and boiling water in a small bowl. Let the mixture cool slightly. In a large bowl, whisk the flour, sugar, baking powder, baking soda, and salt together. 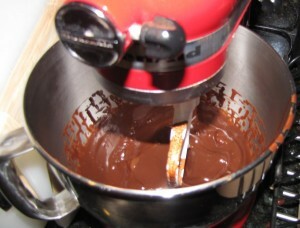 In a medium bowl, whisk the oil, egg, vanilla, and cooled cocoa mixture. 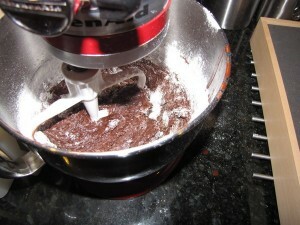 Stir the flour mixture into the chocolate mixture a bit at a time. Give the batter a final stir and scrape it into the prepared pan. Gently tap the pan on the counter to remove bubbles. Bake for 35-40 minutes, until a toothpick comes out clean from the center. Let the cake cool completely in the pan, 1-2 hours. 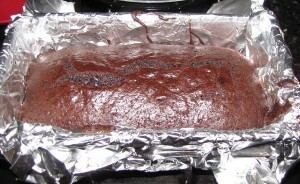 Use the foil “sling” to remove cake from pan. Beat the butter, cream, salt, and vanilla in a large bowl with electric mixer on medium-high speed 1-2 minutes, until smooth. 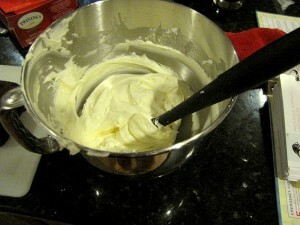 Reduce the mixer speed to medium-low and slowly add the sugar. Beat until incorporated, 4-6 minutes. Increase speed to medium-high and beat until the frosting is light and fluffy, 5-10 minutes.